Restaurant Institute has opportunities for you to be published. You can submit an article for our brand new quarterly publication, [ FB&L ] Food, Beverage, and Labor Cost Control Quarterly, being launched in the Fall of 2018. To submit the article, click on the button below. To subscribe to the magazine, scroll down and click on the subscribe button. 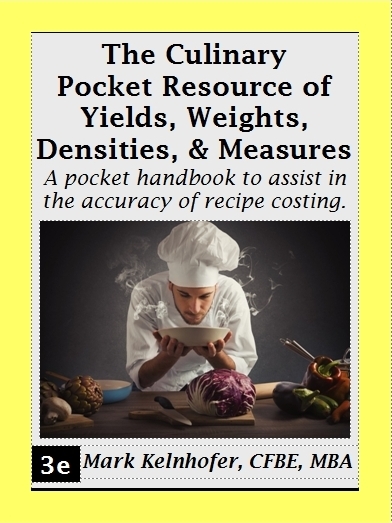 A must have tool for all culinary and foodservice professionals. Easy reference guide to assist in recipe costing and menu development. Included are densities, weight conversions, temperature conversions, process and can yields and so much more! Keep the important data close to you with this pocket book. A must have for every culinarian and foodservice professional. Learn about the importance of recipe costing, inventory management, cost controls, performance benchmarking, just-in-time (JIT) practices, menu engineering, financial analysis to benefit your operations. A primer that all within the industry should possess in order to be successul! Register today for your complimentary subscription! Click on the 'Subscribe' button to the left to be notified when our magazine is released. The first issue is projected to be launched in fall of 2018.